More than 100 protesters were arrested Wednesday after a rally outside of McDonald's corporate headquarters in Oak Brook, Ill.
OAK BROOK, Ill. (WLS) -- More than 100 protesters were arrested for criminal trespass to property Wednesday after a rally outside of McDonald's corporate headquarters in Oak Brook, Ill. Between 1,000 and 1,500 protesters on 32 buses gathered at Jorie Boulevard and Kroc Drive to rally for $15 an hour and the right to form a union. The protest comes just ahead of the annual shareholders meeting Thursday. Protesters were met by police in riot gear and told several times to leave, police said. Police then took some workers into custody peacefully. 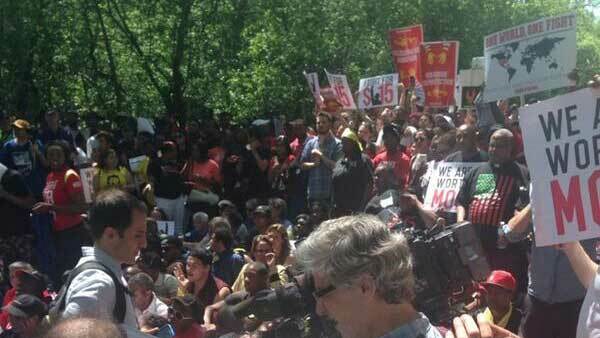 Hundreds of McDonald's workers protested Wednesday at Jorie Boulevard and Kroc Drive in Oak Brook outside the fast food chain's corporate headquarters. "As workers we went on strike, we've talked to other workers, we've had petition signings in our store, we've done all we can - plus meetings with general managers," said Janah Bailey, a McDonald's employee. "We've done all that we can, so right now, my presence is saying that I'm taking that step further and to take it up a notch, because obviously what we've been doing is not enough." "McDonald's is the leader in the industry; it's the fastest growing industry in the country," said Kendall Fells, a protest organizer. "And these workers are here to look shareholders in the face and say, 'We do work for you, we are growing and we're not going to live in poverty while you sit here and take home billions of dollars in profit.'" Early Wednesday, protest organizers changed the location of their demonstration after learning that McDonald's cleared out the building where they had planned their actions. McDonald's said it asked workers from that building to work from home due to its location in a high-traffic area, but that the rest of the campus remained open. "We respect the right to protest, to peacefully protest. And I think that's what you saw here today," said Heidi Barker, McDonald's spokesperson. "When it comes to the minimum wage, that's a national discussion. It's not a McDonald's issue, it's an economic issue. We'll look to the folks in Washington to determine what happens." Protest organizers said they will be back Thursday morning at 7 a.m. for the shareholders meeting, which will go on as planned. The minimum wage issue is not on the agenda.